The Federal Reserve is expected to begin cutting back on its purchases of bonds as early as this month, analysts say, but global bond markets recovered in July, when Fed officials backed away from preannouncing the tapering of its stimulus program. The S&P US-Issued Investment-Grade Bond Index held on to a positive return of 0.7% in July. “Staying in the positive [territory] for the month was a welcome change after the June and May returns of -2.5% and -2.2%, respectively,” according to a report by S&P Dow Jones Indices. European bond markets, as measured by the S&P Eurozone Sovereign Bond Index, were up 0.8% in July, following declines of 1.3% in May and 1.5% in June. Equity markets were also up in July, with the S&P 500 gaining 5%. 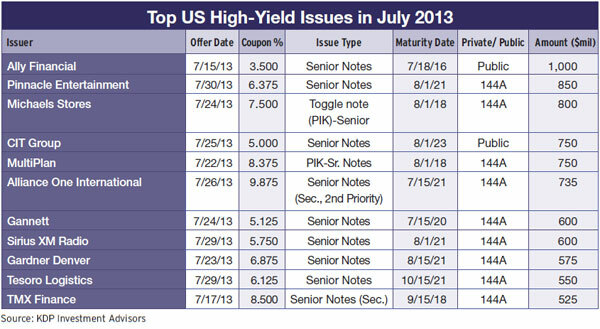 The search for yield propelled the S&P US-Issued High-Yield Corporate Bond Index up 1.7% for July and 2.9% for the year to date. The index was down 2.6% in June, after Fed chairman Ben Bernanke said tapering could begin later this year. 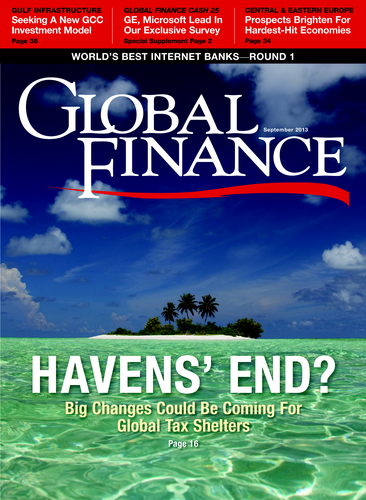 In addition, higher interest rate volatility can be attributed to economic fundamentals (including getting closer to the acceptable unemployment threshold), policy changes (such as the removal of large-scale asset purchases) and coming leadership changes at the Fed, as well as the unwinding of leverage in the financial system, the report said. 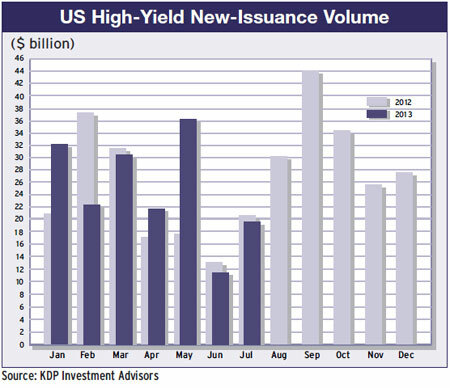 Total issuance of bonds in the US high-yield market rebounded in July to $19.4 billion from $11.5 billion in June, according to KDP Investment Advisors. However, that was still well below the high for the year to date of $36.2 billion in May. Detroit’s Ally Financial, the auto lender that is majority-owned by US taxpayers, issued $1 billion of three-year senior notes with a coupon of 3.5%. Ally Financial also sold $375 million of three-year floating-rate notes. The former financing arm of General Motors, Ally has been pursuing asset sales as it seeks an IPO to help repay a $17.2 billion bailout. Las Vegas–based Pinnacle Entertainment issued $850 million of eight-year senior notes with an interest rate of 6.375%. The company plans to use the proceeds to help finance the cash consideration for its pending acquisition of Ameristar Casinos. Michaels Stores, a Texas-based retailer of arts and crafts merchandise, issued $800 million of senior PIK (payment-in-kind) toggle notes, due in 2018. The first two interest rate payments are required to be made in cash. The borrower has the option of paying the remaining interest in cash semiannually at a rate of 7.5%, or waiting until maturity to pay interest of 8.25% annually.